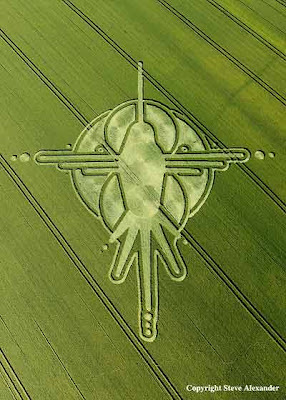 It's been an incredible Crop Circle Season 2009 with over 40 formations in the UK in the last 3 months. 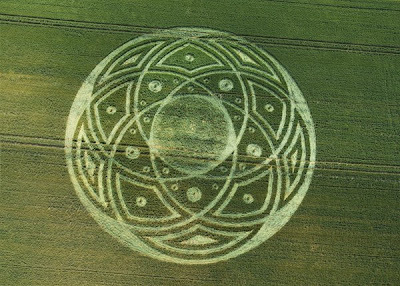 We have so far witnessed some of the most fascinating depictions of sacred geometry with a message of transformation and signs to the upcoming Penumbral Lunar Eclipse on July 7th 2009. 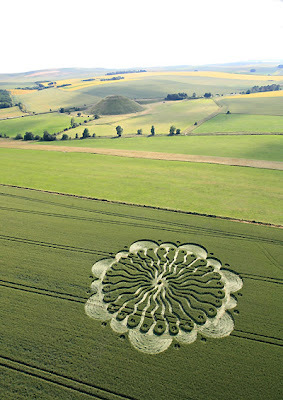 The first crop circle of July was reported yesterday on the 1st of July 2009 at Waden Hill, near Avebury, Wiltshire. 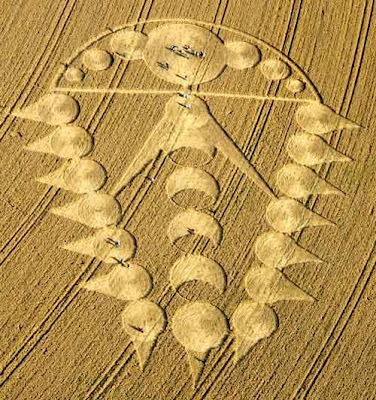 The formation seems to symbolize 'Somvarta', the galactic burst of cosmic rays which emanate from the centre of the Milky Way Galaxy, 'Hunab Ku'. As the sun is moving towards the galactic alignment of 2012, the sunspot cycles are also increasing in intensity transforming life on earth as we know it. 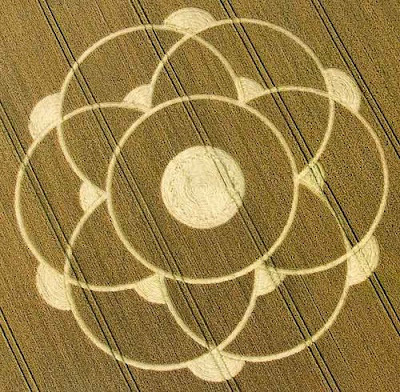 This change, this spontaneous evolution in the presence of new energy, is also happening to the whole Solar System. It's not just that the Earth is drifting away from the Sun to go into a new position. At the same time the Sun, also, is ready to break out into a new level of energy in the Galaxy. 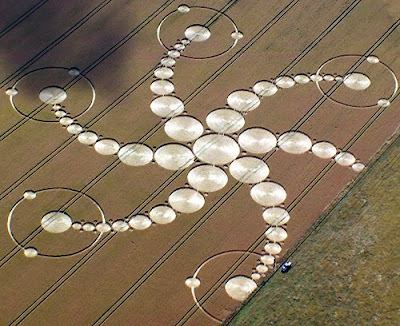 As a galaxy evolves, expanding spheres of energy continue to engulf the stars in that galaxy with higher and higher levels of vibration. This is now causing the intergalactic space around our Solar System to become more and more highly charged. This charge is in turn absorbed by the Sun and radiated throughout the Solar System. So the current ''shift'' is really a unique galactic event. The space between the planets is actually conducting energy better. The Sun releases charged, radioactive particles, such as energetic protons. Normally these protons travel at a speed which was fixed to the Earth. Now, these protons are traveling up to four hundred percent faster than before. The Sun itself is actually changing. Its magnetic field is actually getting larger. It's energy is changing. The energy between the planets is changing, conducting the Sun's energy faster. Particles are moving faster through space. The actual visible Plasma Energy in space between the planets is getting brighter. 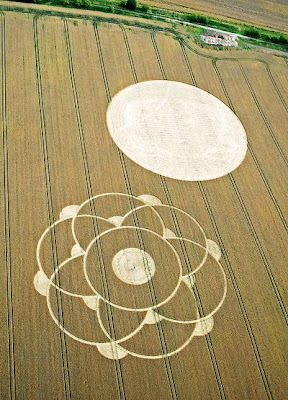 The Solar System is moving into an area where the energy is more highly charged. That higher-charged energy is in turn exciting the plasma and causing more of it to form, more luminosity, more brightness. 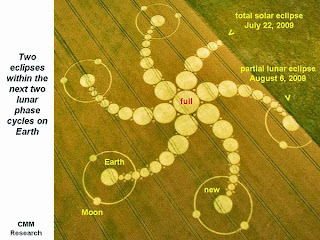 This energy is then flowing into the Sun, which in turn emits the energy and spreads it out along its equatorial plane. This in turn is saturating interplanetary space, which causes the solar emissions to travel more quickly and charge up the energy on the planets. 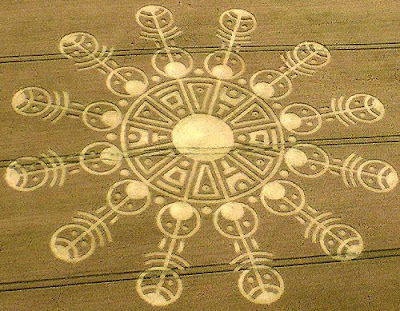 And this is conscious energy that is changing how the planet works, how it functions, and what kind of life it supports. 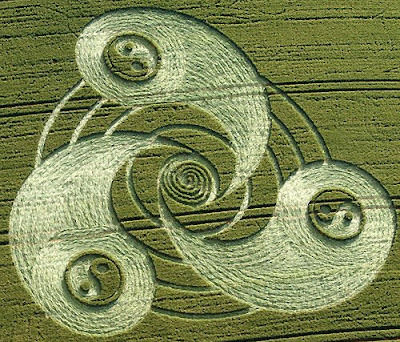 The harmonics of the DNA spiral itself are altering. 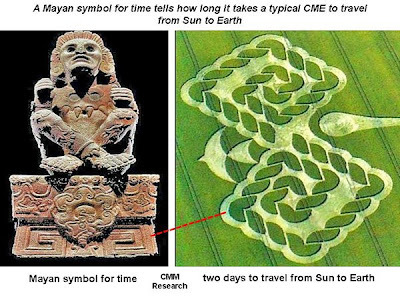 Coronal Mass Ejection ... Mayan Timeline ... A Swallow & Rope Strands ... 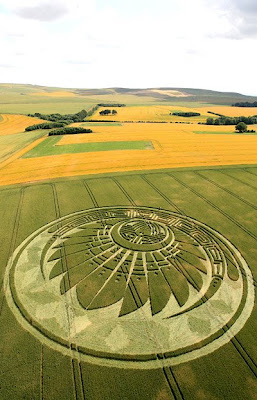 Crop Circle Reported on the 4th of July at West Down Gallops, near Beckhampton, Wiltshire ! Swallows were associated with stars and therefore the souls of the dead. Chapter 86 of the Book of the Dead specifically instructs the deceased on how to transform into a swallow. 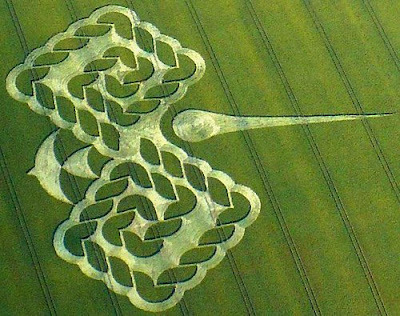 In Spell 1216 of the Pyramid Texts, the pharaoh describes how he has "gone to the great island in the midst of the Field of Offerings on which the swallow gods alight; the swallows are the imperishable stars." The imperishable stars were those near the North Star that never seemed to rise or set, and therefore were "constant". The swallow also appears in paintings of the solar barque as it enters the underworld. The swallow is usually shown on the prow of the boat. In this context, the bird appears to be an announcer of the sun's approach. In Egyptian love poetry, the swallow declares the dawn of new love ! 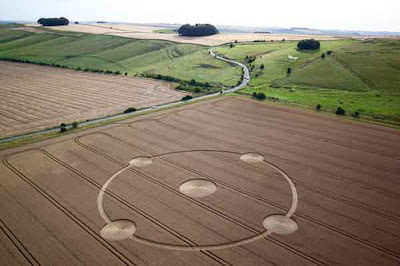 Crop Circle at Honey Street Wiltshire UK Reported on the 6th of July 2009 ! 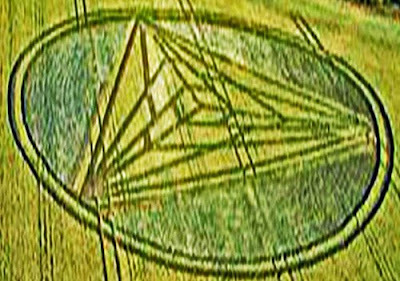 The Cube Tetrahedron Pyramid Symbolism Crop Circle Chesterton Windmill near Harbury Warwickshire. Reported 9th July 2009 ! 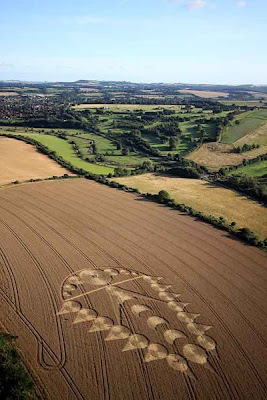 The Galactic Butterfly / Hunab Ku Crop Circle Cannings Cross, Near Allington, Wiltshire, Reported First on the 27th of June and then Phase 2 was reported on 10th July 2009 even though the farmer ran his tractor clipping the edges of the inner rays ! 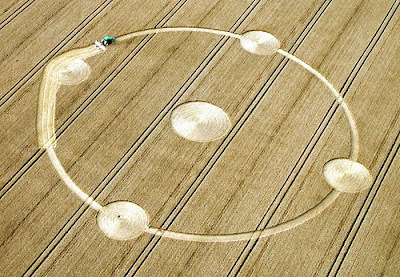 The Ouroboros / String of Pearls Crop Circle Radford Hill, Near Radford Semele, Warwickshire. Reported 11th July 2009. 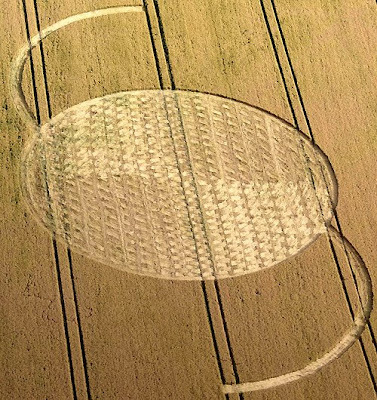 The Intraocular Lens Weaved Eye Crop Circle East Field, Near Alton Barnes, Wiltshire. Reported 14th July 2009. 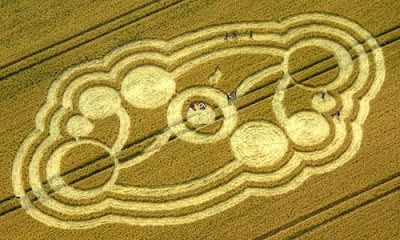 The Yin Yang Spiral Crop Circle Grey Wethers, near Temple Farm, Wiltshire. Reported 14th July 2009. 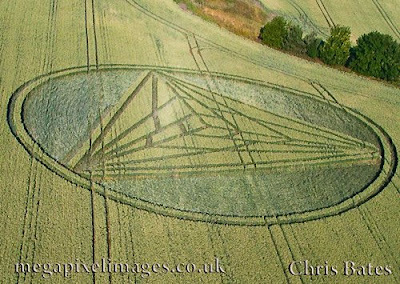 The Compass Orientation Symbolism Crop Circle Hinton Admiral, Near New Milton. 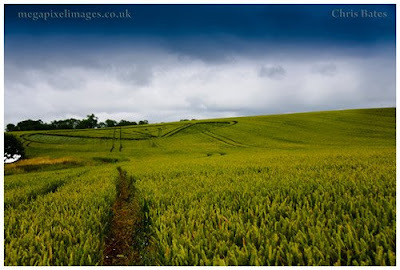 Hampshire. Reported 14th July 2009. 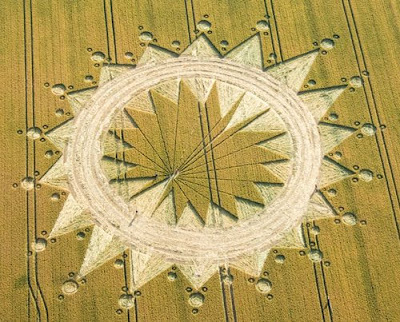 The Julia Set Eclipses Crop Circle ... Reported at Martinsell Hill, near Wootton Rivers, Wiltshire. Reported 19th July 2009. 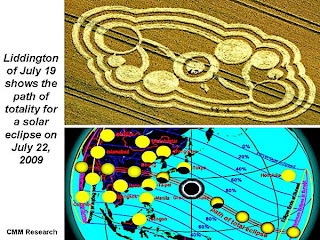 The Missing Circle symbolizes the Total Solar Eclipse of 22nd July 2009, the one partially visible is symbolic of the partial lunar eclipse of Aug 6th 2009. 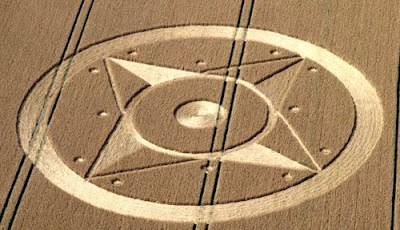 The Total Solar Eclipse 22nd July 2009 Crop Circle Reported at Liddington Castle, near Badbury, Wiltshire. Reported 19th July 2009 ! 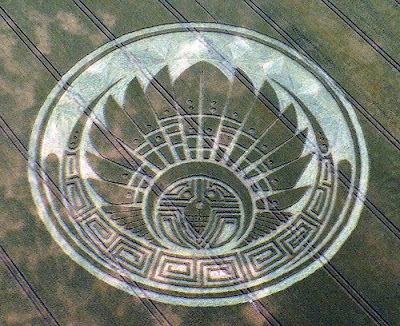 Another Mayan Crop Circle formation reported at Smeathe Plantation near Ogbourne Down Gallop, Wiltshire on the 24th of July 2009 ! 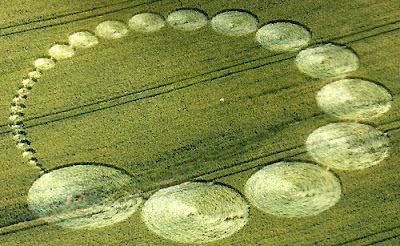 A Comet Like Crop Circle Formation with probable lunar significance pointing in a certain direction. Ogbourne St Andrew, near Marlborough, Wiltshire. Reported 29th July 2009 ! 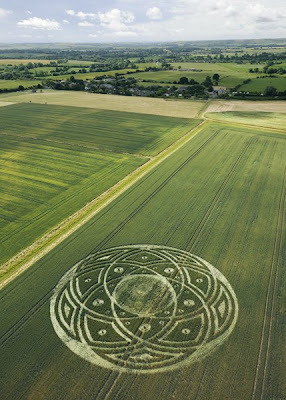 Crop Circle Reported at Winterbourne Bassett, near Avebury, Wiltshire, July 31st 2009 ! 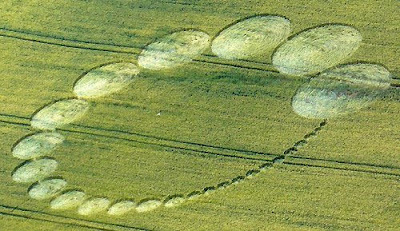 A formation appeared in the same field on the 28th of July and the farmer cut it down, seen as a circular patch in the picture above. 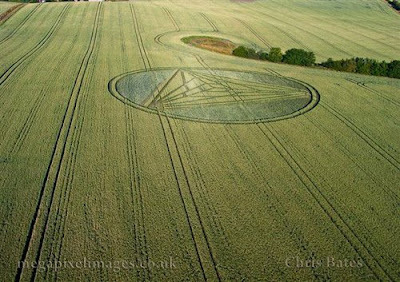 Three days later on July 31st this simple and elegant, sacred geometry crop circle formation was reported at Winterbourne Bassett, near Avebury, Wiltshire, 2009 right next to the one the farmer chose to mow ! 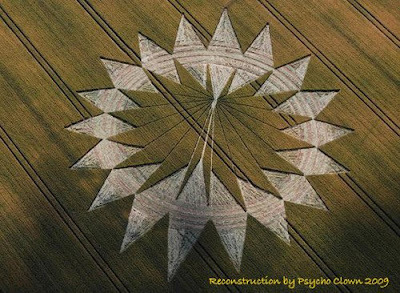 (((***))) This post will be updated with fresh crop circle reports as they happen .... stay tuned ! 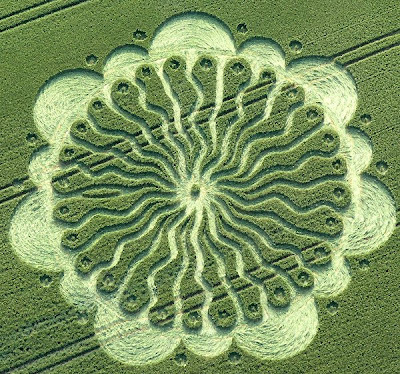 Who Is Making These Crop Circles ? 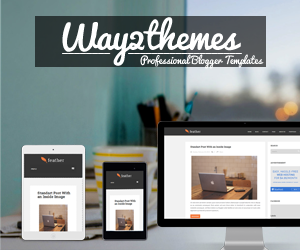 Would like all your thoughts,,, and the webmaster to visit our site .. We need your views on this ..
Amazing website by the way..